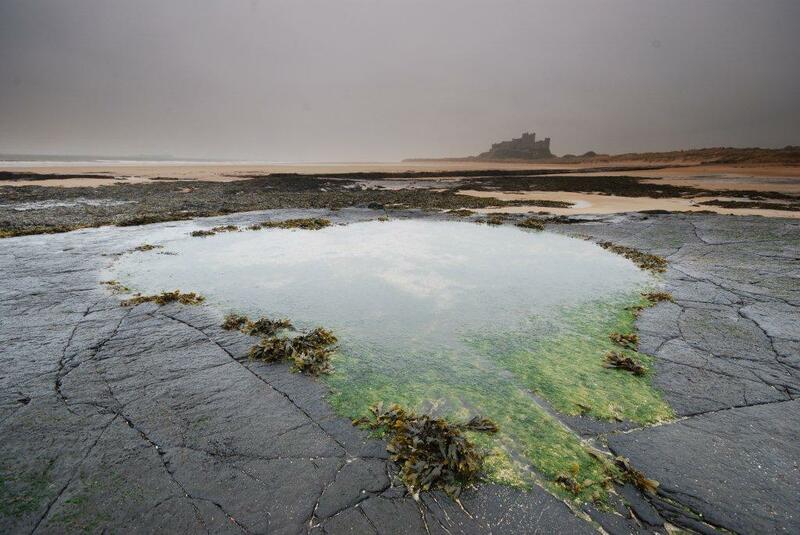 Fortunately there are photographers who appreciate the ‘golden hour’ so, at 04:50 on Saturday, I met up with Doug at Bamburgh in the murk and gloom of what appeared to be pretty uninspiring light. Things can usually be rescued though, and we looked at camera settings while it was still quite dark then, as soon as there was some light, we set about exploring composition and exposure metering. With a bright cloudy sky it was time for a bit of creativity; first exposure compensation, always a useful technique when a very dark, or a very bright, area is dominating the scene. Then, the technique that comes into it’s own when there’s a wide range of exposure values between the sky and the foreground – Doug’s wide-angle lens has the same diameter filter thread as my mine and I got my set of ND graduated filters out of the car so he could reduce the brightness of the sky/increase the brightness of the foreground. Dull and uninspiring was transformed into something much more dramatic, and the hours had flown by. I’m really looking forward to seeing Doug’s images from the day, and I’ll be meeting up with him again on our Farne Islands photography workshop on 28th June. We’ve got a couple of places available on that one, so give us a call on 01670 827465 if you’d like to come along and learn how to get more from your camera. Doug has very kindly provided us with two of his images from the day, which we think are superb 🙂 You can click the images to see full-size versions. 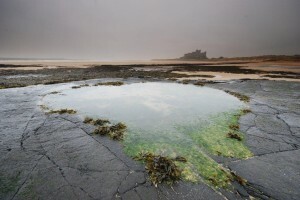 When I set off from the Lord Crewe Hotel in Bamburgh the rain was beating against the bedroom window and outside it was extremely blustery – not the most inspiring start to my Dawn Photography course with Northern Experience. I met up with Martin at Stag Rock doubtful that we would be able to salvage anything from the conditions. We sat in my Landrover and Martin looked at my camera to familiarise himself with some of the features it had. It had stopped raining by this time so we togged ourselves up in cold weather gear (Martin with two pairs of gloves) and went down to the beach. 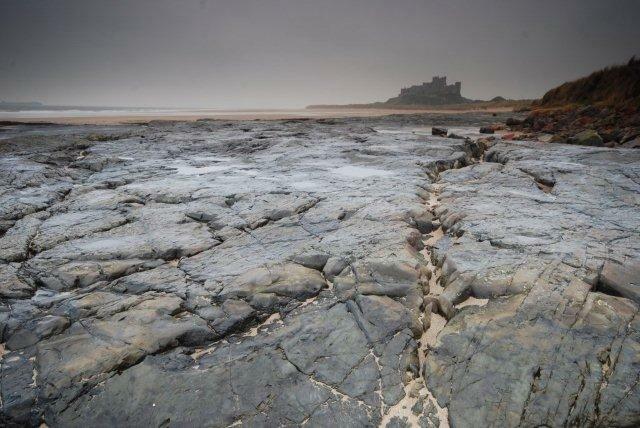 Martin chose a suitable spot and explained the elements of composing a good landscape photograph. After reviewing some of the shots I had taken which were pretty dull and uninspiring , he fetched his ND graduated filters and I was amazed at the difference these made in highlighting the contrasts in what was quite a grey landscape. The time flew by and we retired back to the Landrover to warm up where Martin explained in detail more about the functions of my camera. I returned to the Lord Crewe for a full English breakfast feeling well satisfied with my ‘Northern Experience. What had looked like being a disaster turned into a very enjoyable and informative photography session. I considered myself fortunate to have had the benefit of what turned out to be a one-to-one bespoke session. Looking forward to the Farne Islands.